I am very much not superstitious, so Friday the 13th means little to me, except it's the weekend! I get to watch a fun video with my sweetie tonight (Cyrano de Bergerac) and sleep in tomorrow. And maybe we'll do something fun this weekend, but there are no plans yet. 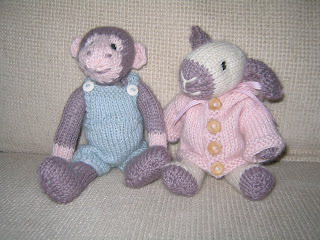 Becky sent me this photo of two very cute toys she knit. They look like good friends, don't they? Oh, and for others who have knit that hooded cardi pattern, it's supposed to be that big! I was thinking of those baggy hooded sweatshirts that teenagers wear (like my little brother), when I was designing the pattern. I keep getting random comments on my post about sharing, and I'm thinking more and more what a good idea that was. I'm also very happy to be putting my principles firmly on that side of the fence, considering what our government is trying to pass into law. There is quite a lot of opposition so far, so hopefully our representatives will understand that it's not in the best interests of the people who elected them! In other random news, I've been reading a book called 'In Defense of Food' by Michael Pollan. I'd watched a fascinating video of one of his lectures, and finally got to the head of the library waiting list for the book. Basically, he discusses the history of nutritionism, and why we should eat real food and not fake food made up of refined nutrients. I have trouble reading non-fiction, becoming bored when there is no story, but I've gotten half-way through this book in about a day. If you really care about your health and what you eat, it's worth reading. Posted by Barbara Prime at 5:02 p.m.
aww i love the little monkey and lamb, they look soo soft. June 14, 2008 at 3:24 a.m.
Hope you too have a nice weekend! June 14, 2008 at 5:39 a.m. I hope the weekend was nice and relaxing, the toys you post pictures of are always so nice. I don't know if I'm supersitious or not - but I know I sure can't spell it. PS - you have been meme-tagged.Pick up the nearest book.Open on page 123.Find the fifth sentence.Post the next three sentences.Tag five people,and acknowledge who tagged you. June 17, 2008 at 12:24 p.m.